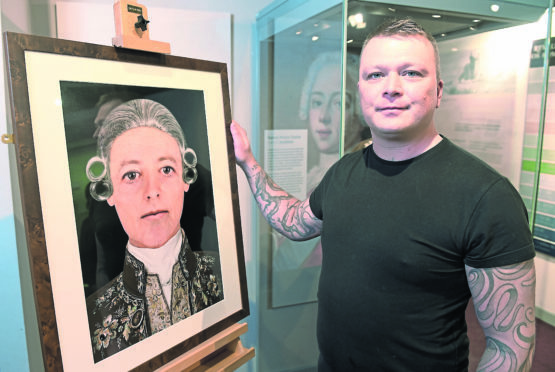 Inverness artist Hew Morrison with his newly unveiled portrait of Bonnie Prince Charlie which is on display in Inverness Museum and Art Gallery. Picture by Sandy McCook. He has one of the most recognisable faces in Scottish history. But Prince Charles Edward Stuart is only known to have sat for a few portraits, more often in his youth, begging the question- what did he really look like? Now we can be pretty sure, says forensic artist Hew Morrison, who with HighLife Highland has collaborated to create a new digital portrait of the prince from his death mask. Mr Morrison, who is from Inverness, has worked on many forensic reconstructions for museums across the country, using human skulls. This time he used a copy of the prince’s death mask, held in the collection at Inverness Museum, to create a striking image of Bonnie Prince Charlie on his death in 1788 aged 67. It’s thought to be the first time a death mask has been used to create a facial reconstruction. The idea came from Mr Morrison while he was in the museum. He said: “I saw the mask in the case, and approached the museum with the idea of doing a digital reconstruction using modern, artistic techniques. “The inside of the death mask was smooth, perhaps due the plaster of the time and the copying from the original mask so I had to estimate a certain degree of wrinkling, taking into account his age, reputed drink problem and the fact he’d had a stroke. “The face shape was very similar to that seen in the portraits, and by comparing the Inverness mask with the copy held in the West Highland Museum, I could establish that he had a straight nose, rather than the suggestions that he had a broken one, which was more likely to be because there was a problem with the death mask copy rather than the actual nose. The jacket in the new portrait is part of the museum collection and on display alongside. HighLife’s decorative arts curator Laura MacCalman said: “The museum acquired it a Jacobite relics auction in Inverness in 1929. “It was bought from a rare book dealer in Newcastle and who said it came from an old house where it was called ‘Charlie’s jacket’. “We’ve managed to date the textile and heavy embroidery to the right sort of time, the 1770s. The portrait is on display in the Jacobite Gallery.